This series ends when my current and projected income is enough to make more than the minimum payments on all of my bills and expenses. In the world of job hunting: I heard back from several employers, mostly for the free lance writing jobs. As far as networking and applying for more engineering jobs this week was a wash. I think that engineering companies generally take a long time to make decisions and hire from "within" that is to say interns or relatives or friends. It's who you know so often that makes a difference. I started Janzen Gear. It has a website and I registered as a sole proprietor in Colorado. So it's real. No more deliberating about doing it or not. Now it's a thing. I have a job? Well, I have a company, wether that counts as a job or not we'll see. In Janzen Gear news I'm talking with several machine shops about ice axe production and I plan on placing an order this week (with my credit card, woohoo more debt). Then I haven't figured out how to sell them exactly but I'll figure it out and start selling and advertising and making tiny bits of money. The harness has been stagnant because I do not have access to a sewing machine to make a prototype, yet. I'm also going to make Janzen Gear t-shirts. If you want to be part of the revolution stay tuned for details. They will be much cheaper than the ice axe and socially acceptable to wear around town, unlike an ice axe or climbing harness. If anybody has an urge to invest in a start-up company, I'll take your money. We can make it formal (written on paper) and you can have input into what I do. It was very anticlimactic actually starting Janzen Gear. It took 15 minutes on the Colorado Secretary of State website and cost only 20 dollars. The website was free and took another 15 minutes. I had always envisioned starting a company with thousands or millions of dollars and rich investors in suits at a board room signing papers and everybody smiling shaking hands. Then bells and whistles and trumpets and maybe fireworks. At which point I would take the afternoon off and buy something expensive like a new computer. Instead it took less effort than this post. It took far less effort than applying for a job. I am really excited to see what I can do with Janzen Gear. I have known for almost a decade that I wanted to start a company and do my own thing. Now I am doing that. So the question now is: will I make succeed? For those of you that are not familiar with Arizona it's usually pretty dry. Much of the state is a desert or very arid. 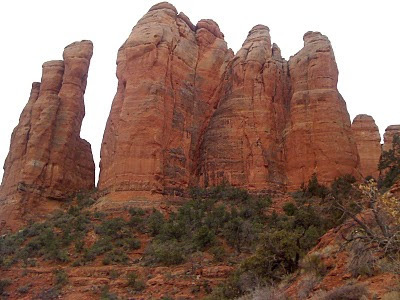 Sedona is famous for it's red rocks. They are these steep (easiest routes 5.9+) towers of sandstone shades of red and orange. They have been featured in dozens of old western movies. Now the town is something of a tourist/retirement place. Which is fortunate for me because we went to several truly amazing restaurants. I had the best steak that I have ever had. I had scallops, twice. As far as running goes it was my lowest mileage week in two months. Only a paltry 71 miles. I took a day off after I think a 46 day running streak. I only doubled once the entire week. On the other hand I PR'd at 15 miles at I think 1:36:something on a treadmill at 4500 feet. I also ran my fastest 5k in practice at 16:50 on a track at 4500 feet. Then I had a nice fartlek session. My right knee has been hurting most of the week I think a combination of hitting it mixed climbing and running three strait days on a treadmill. I don't think it is an overuse injury from bad form or bad shoes because it has been getting better every day. Motivational quote of the week: "Everybody gets knocked down. How quick are you gonna' get up?" - The Hours, Ali in the Jungle (as seen on the newest Nike commercial). By the way Simpson on the mountain refers to Joe Simpson crawling down the mountain after Simon Yates cut the rope and he fell into a crevasse. Simon Yates still climbs extensively these days. He is rumored to even party in Katmandu from time to time.